This is the time of year for pears. This elegant, not-too-sweet dessert cooks up in the microwave in 15 minutes. This recipe comes from the wonderful introduction to microwave cooking, The Great Microwave Dessert Book by Thelma Pressman. Peel pears, leaving stems intact. Place in large bowl with water and lemon juice to keep pears from turning dark. Combine water, sugar, cinnamon and lemon rind in a 2-quart round baking dish. Cook on in the microwave on high (600-700 watts) for 5 minutes. Add pears, turning them in the wine to coat completely. Cover with waxed paper and cook on high about 9-10 minutes, until pears are just fork tender. 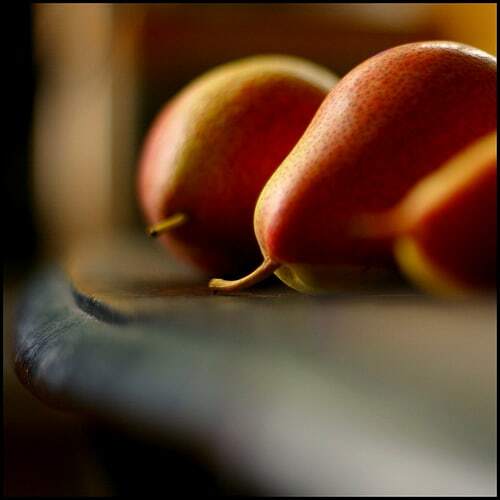 Turn pears once or twice during cooking to keep them nicely colored. When pears are tender, spoon juices over them while they cool (pears should remain in liquid until ready to serve). Serve at room temperature, or chilled. Add a piece of mint to the stem before serving. Keep in mind that many microwaves use 900 to 1000 watts on high, so lessen the cooking times accordingly (to about 4 minutes for the first stage, and 7-8 for the second). Looks interesting but I’m not really a pear person. bosc pears would be particularly good for this recipe. they are nice and crunchy and cook up very nicely.